I've been slowly cleaning the house. My mom is coming this far before we head off to the wedding. We all have our tolerances for dust and dirt and where we will and won't clean daily, weekly, monthly. My mom has said she doesn't care, but she's company, so I'm cleaning in places I don't usually clean, back of closets, behind dressers, etc. 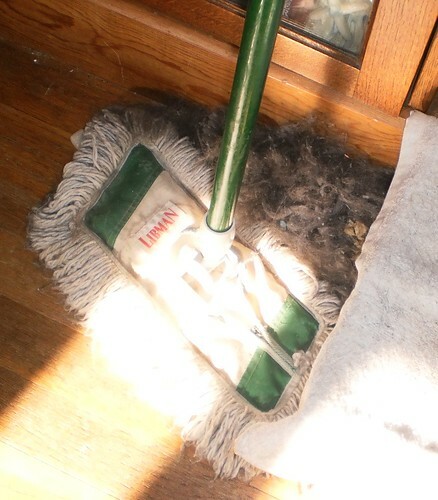 Now, I have to admit to not having thoroughly swept floors since February. It wasn't high on my list of things to do and the floors didn't feel gritty or grimy or dirty. Oh there were places where the dust bunnies were breeding but a cursory swipe with the mop got rid of those. On Thursday, I swept the bedroom and the hall, poking behind and under things and moving all the stuff out of the hall closet. I had a dead vacuum in there and it had just sat. Carole gave me hers, but it's really only for rugs since I have hardwood floors. Carole's sat in the living room because my inertia hadn't gotten me around to removing the broken one from the hall closet. Yeah, there was a lot of dust under and around the old vacuum. That's all I did on Thursday. I finished sweeping the living room last night. The house feels cleaner just doing that much. My bedroom instantly felt cleaner after I'd swept under and around things and moved the dust into the hall to be swept away. It's funny how just that little cleaning made the house feel cleaner. I have to finish cleaning the bathroom, wash the kitchen floor and sweep the floor in the office, but those are the icing on the cake, so to speak. I want to wash the living room rugs to remove someone's fur. I might not get the dusting done but I don't really care. The floors are swept and that makes things feel clean. Of COURSE It Would Happen While I Was Gone! Now What Did You Do? The Last Thing Has Arrived.